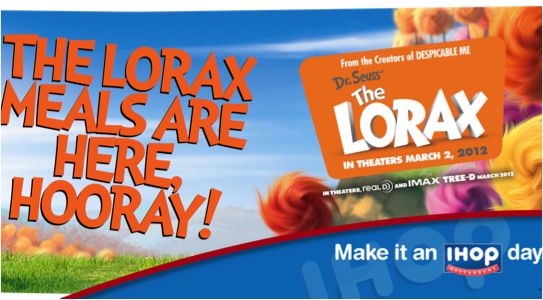 To increase drive traffic into IHOP restaurants and to engage IHOP consumers with an entertainment tie-in that surprises and delights, IHOP partnered with The Lorax. Recycled Paper Bookmark with Seeded Paper (diecut and with an Evergreen mix of Blue Space and Canadian White Pine seeds). In-store POP including: Activity Booklet, Posters, Window Clings, Stanchion sign, Server T-shirts, etc. Microsite page including: menu page highlights themed menu items, sweepstakes entry, advergame.